There weren’t much functionality added to antivirus solutions in years. See file, freeze, determine if it is malware, unfreeze or kill. So much of progress is focused on specifics of these steps. 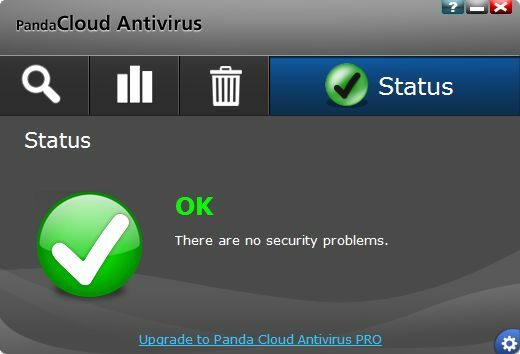 Panda Cloud Antivirus is (supposedly) light solution that uses constant Internet connection to improve on classic antivirus steps. As for main function this one is usual background monitor that sits in the tray and checks the files. The main difference is that instead of regular database updates it checks for information about files online (I assume by transferring file hashes or something like that). When connection is not available it relies on some amount of cached data. Interface is done in fancy/minimalistic style. Few large buttons, clear explanations where needed, no confusing terms. Panda is often described in reviews as having light memory footprint. Not exactly true. Interface process is indeed light, consuming as little as 4-5 megabytes of memory. But there is also background service that hovers ~20MB when idle and can easily jump as high as 75-100MB. As for me interface is strongest part. It is the most straightforward interface experience I remember in background antivirus monitors. It doesn’t flood you in see-I-am-awesome junk, it gives you essentials. Experience seems to be tailored towards novice users. If virus is detected Panda only gives brief non-scary (important) popup in the corner and file is deleted. No flashing red light or unneeded questions, that confuse the heck out of users. Panda is known for their developments to autorun as malware delivery method and monitor stresses that autorun is being disabled. Cloud part is marketing speak as for me. I don’t see any technical difference between downloading database updates and downloading cloud data to cache. On other hand there is no way to perform manual offline update. Useless for computers not connected to Internet, easily disrupted by malware. Settings are lacking. “Advanced” dialog is a joke with some log-related options and primitive file/folder exclusions list (no wildcards). no auto-update of engine; major downside even if updates are infrequent so far. Techies are unlikely to drool over this one. However interface experience makes it compelling choice as home/family antivirus. No automatic upgrades of engine in free version is only thing that limits it from perfect as such. I don’t see the point here. The Panda site describes this cache as a small but well chosen subset of the total detection capability. In essence when you become disconnected, unlike other antiviruses you also lose protection from viruses you had been protected from earlier. Whats the point of not caching everything for offline use, when the only disadvantage I see is a little more disk space being taken up by the cache? Me neither… By the way it isn’t that “small” subset, cache folder on my computer is currently ~48MB in size. This is totally comparable to databases of generic AV engines. As I wrote in post distinction seems in marketing rather than in practical functionality. “The local cache of Panda Cloud Antivirus is a ‘moving target’ of what the community ‘sees’ out there circulating in the wild. However, it’s not quite the same as the traditional signature updates which are always incremental (always adding signatures, not taking them out)”. So this was what I hadn’t understood. When a computer is offline for quite a few days then the moving target can change and meanwhile the computer can get infected via old viruses back in circulation. I do agree however that it is more marketing speak than anything else. As I described in post, cloud is more of marketing speak – it still downloads a lot of data to hard drive. And only difference from generic database updates in other AV is that it isn’t called that. No idea on ranking (and it’s mostly meaningless anyway), but I vaguely remember reading some very unhappy reviews about CA AV. I’ve used this on some client’s PC’s. It runs much leaner then other AV’s. Indeed it is a good choice for a very basic home pc setup. I wouldn’t use it on a Company PC.